More ways to read the full SMARTbook lineup anytime, anywhere. In addition to paperback, SMARTbooks are also available in digital (eBook) format. Our digital SMARTbooks are for use with Adobe Digital Editions and can be used on to up to six computers and six devices (authorized to a user’s Adobe ID), with free software available for 85+ devices and platforms—including PC/MAC, iPad and iPhone, Android tablets and smartphones, Nook, and more! Digital SMARTbooks are also available for use on the Kindle Fire (using Bluefire Reader for Android). 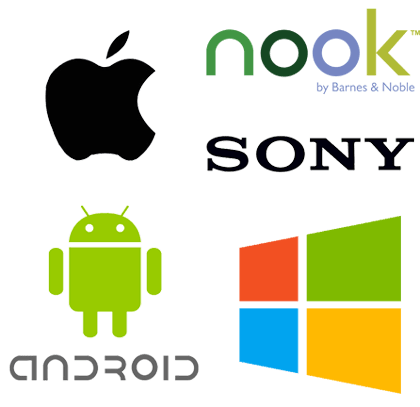 Transfer your digital SMARTbook directly to your Barnes & Noble Nook and Nook Color using the Adobe Digital Editions software. See the full list of 85+ devices and applications here! Once you install Adobe Digital Editions, select “Authorize Computer/Device” under the settings/help menu and sign-in with your free Adobe ID (if you don’t already have one, you can create one). Adobe Digital Editions 4.5 allows seamless fulfillment of books across devices. When a user fulfills a book on one device, the book will be automatically downloaded via AirSync to all the other devices that belong to that user (activated using the same user ID). Just install Adobe Digital Editions software on your new/additional devices (PC & Mac, iPad & iPhone, Android tablets and smartphones, Nook, & more) and sign-in with the same Adobe ID. See the full list of 85+ devices and applications. Find your information quickly and intuitively! In addition to pan and zoom, our table of contents, A-B-C, 1-2-3 charts, and index are fully linked and interactive. At a course or on TDY and need a copy of a particular chart or diagram? Our digital SMARTbooks allow you to print and copy up to 20 pages for personal use. Users can also highlight text, create their own page notes, and add bookmarks. Use the “search” feature within Adobe Digital Editions to lookup keywords. Select a term you are looking for, then jump directly to that page.